Hey, Can You Spare $78 Billion? This story in the Washington Post is unbelievable. If this had happened in the private sector, people would have been fired immediately. “Isn’t that a terrible way to look after the taxpayers’ money and to make purchases anywhere?” Sen. Richard C. Shelby (R-Ala.), ranking member on the Senate Banking Committee, said at a hearing on oversight of the bailout. “In other words, they misled the Congress, did they not?” said a visibly flustered Shelby. When a Republican senator is openly accusing the Bush Treasury Department of misleading Congress, you know it’s bad. Although his specialty is national security affairs and terrorism, the New Yorker’s Steve Coll has written two blog entries about the current state of the global economy, with extensive reference to historical analogies to make his points about where we are right now. One is about the impact of the economy on the next president’s national security agenda. The other is a history of market panics going back to the Great Depression. 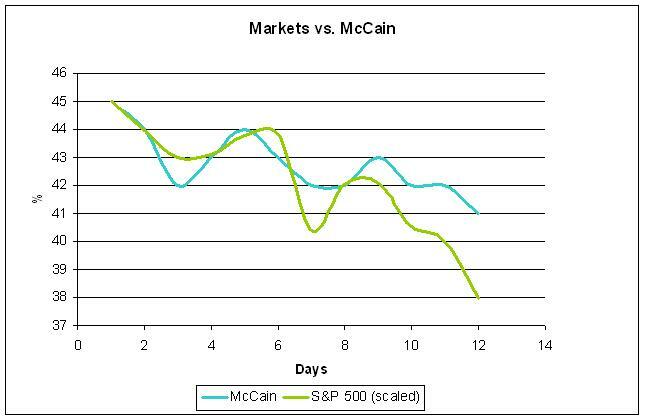 State of the Union came up with this nifty graph showing how eerily similar McCain’s poll numbers coincide with the S&P 500. McClatchy has an interesting story about how the Latin American Left is gloating about the federal government bailout in the United States. The whole thing is worth reading. CARACAS, Venezuela — They don’t call him President Bush in Venezuela anymore. With the Bush administration’s Treasury Department resorting to government bailout after government bailout to keep the U.S. economy afloat, leftist governments and their political allies in Latin America are having a field day, gloating one day and taunting Bush the next for adopting the types of interventionist government policies that he’s long condemned. “We were just talking about that this morning on the floor,” said Congressman Edwin Castro, who heads the leftist Sandinista congressional bloc in Nicaragua. “We think the Bush administration should follow the same policies that they and the International Monetary Fund have always told us to follow when we have economic problems — a structural adjustment that requires cutting government spending and reducing the role of government. “One of our economists was telling us that Bush has just implemented communism for the rich,” Castro said. FYI, the phrase means “In loss, there is the truth” in Latin, a variation of a famous phrase attributed to Pliny the Elder. Following up on my post from a few days ago where I mentioned the potential consequences for the Republican Party based on the events of the last couple of weeks, the Washington Post has written this story outlining fears of GOP strategists that they could be in for another drubbing at the polls on Election Day in the aftermath of the economic crisis.